Last night I called my friend, Christine Mack, and asked her if she wanted to go for a ride. It meant she was driving because I’m giving her driving lessons. She said yes. I picked her up, just after 6:00 p.m., and off we went. She knows the route, so the first stop was the Port of Gold Beach. She was the first to see, and she pointed out to me, a seagull and an osprey chasing a second osprey that was carrying an eel. 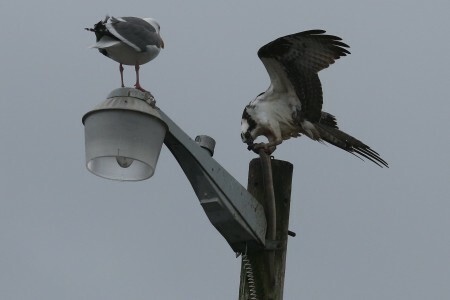 They were flying like fighter aircraft in combat, pulling tight maneuvers with the two in pursuit chasing the one with the eel until that second osprey accidentally dropped its catch into the water. The chase was abruptly terminated and everyone was out of luck. I got a few photos, but the sequence isn’t sharp enough for me to post. Christine drove a little further, to the south jetty of the Rogue. Nothing was happening there, so we decided to drive out to Ophir, about seven miles north of town, to see if we could find elk. But, as we were leaving the port, she suddenly saw several ospreys sitting atop light posts in a parking lot. They were eating eels they’d pulled from the river. Though she cautiously pulled into the lot, all but one, the osprey below, flew off at our approach. But one’s enough and I began taking photos of it. The camera is my Canon 5D Mark III with a Canon EF70-200mm f/2.8L IS II USM lens. All five of the photos were blown up and cropped. I also lighted and sharpened them using Photoshop CS4. Ospreys eat their catch starting with the heads and the eel this one had caught was pretty big. 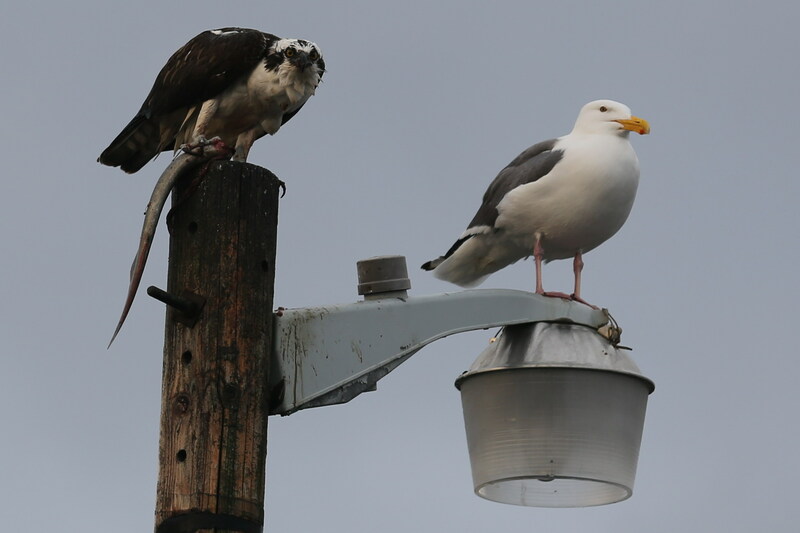 What amused Christine was that soon after we arrived, a seagull landed on the lamp next to the osprey. 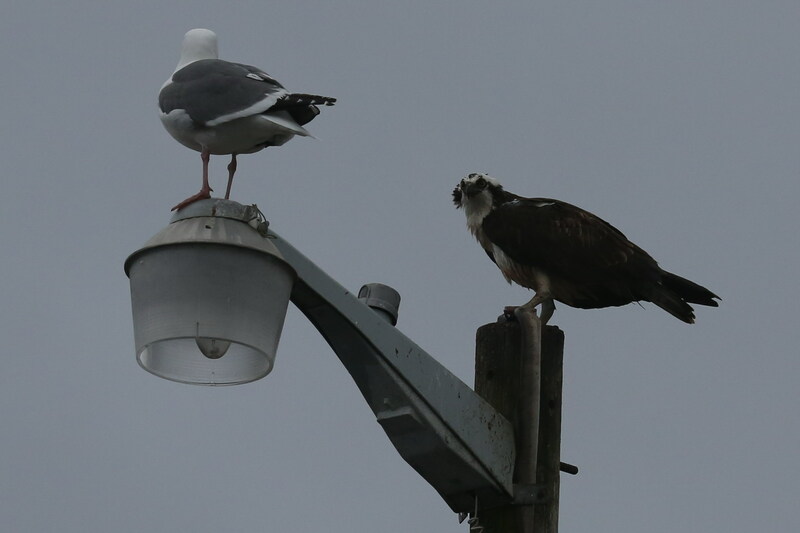 Though the osprey glared at it, the seagull stayed and the osprey soon returned to its meal. The seagull wasn’t welcomed company, but it knows not to try to take the osprey’s catch. However, it could wait because the osprey may accidentally drop the eel or even eat its fill and leave some scraps. The spreading of the osprey's wings seemed to be more of an effort to keep its balance atop the post that to impress me or the seagull. So, we returned to the parking lot. 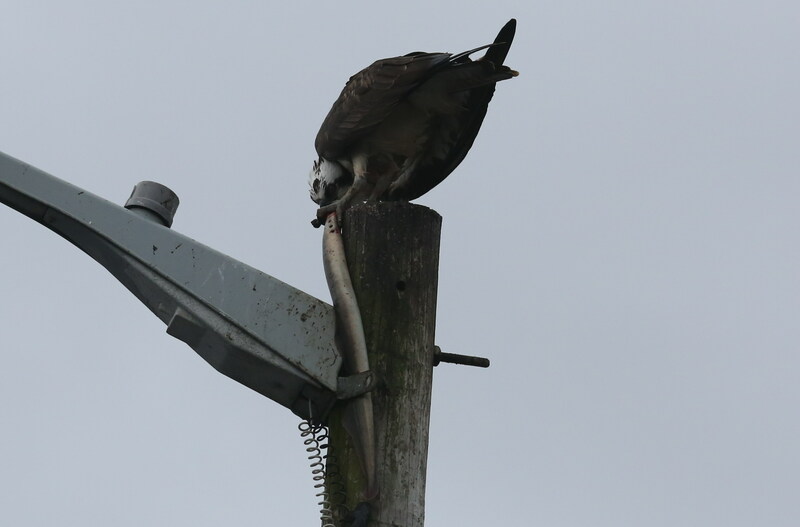 The osprey had consumed about half of the eel while we were gone. But the way it glared at me, I could tell it wasn’t happy to see me back. 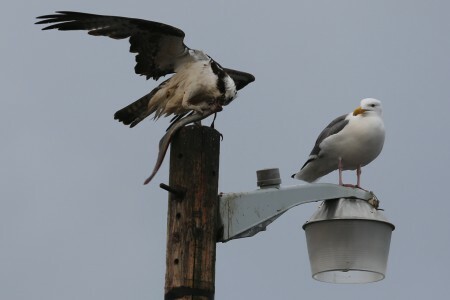 The seagull, ever patient, still waited for the ort or a slip on the osprey’s part where it might drop the eel to the ground.